Hi Friends, Happy Tuesday! The last week or so has been a flurry of activity with end of school events gearing up, my sweet daughter's birthday was yesterday, and oh, that little One Room Challenge thing I have going on. I've had many late, late nights for the past few days, but I'm happy to report that the room is finished!!! I can't wait to share it with you on Thursday. My friends on Instagram have seen a few peeks and have been so encouraging, thank you! Today I'm sharing a project that I've debated for years (I totally get how some of you feel stuck on design decisions sometimes... I do too!). I even asked for your suggestions about 2 years ago in a post. 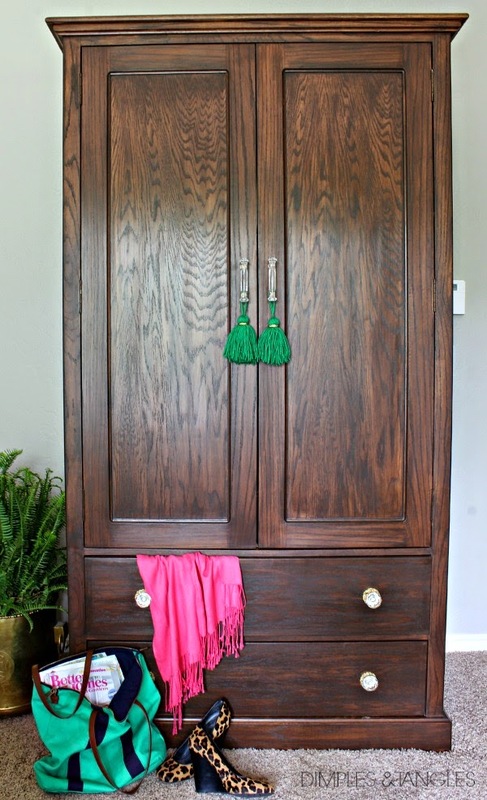 This armoire is special because my Dad made it. A family friend commissioned him to make it about 20 years ago and they used it in their home, but when they no longer had a place for it, I was able to purchase it back from them. It's oak, very substantial, and super heavy. It's still in perfect condition, yet, as with most oak, has taken on that orange-y tone. I had such a tough time deciding what to do with it, because although I knew that paint would be an easy fix, I couldn't quite bring myself to paint over the beautiful wood that my Dad worked so hard on. It's been a media cabinet in a few former homes, but with the built in bookshelves in our Living Room in this home, it didn't have a place. So, we moved it to the bedroom. 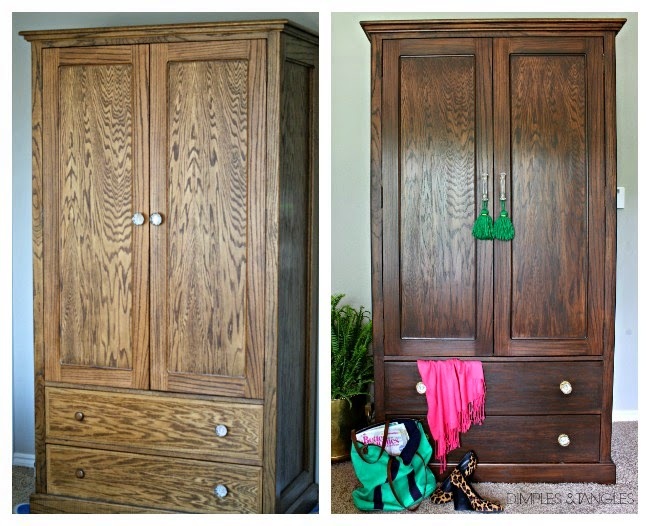 Since we don't have any type of dresser in the room, it's been great for extra storage (confession, my husband gets the two drawers, but the entire top is packed with pillows, lampshades, fabric, etc!). Ultimately, the decision to keep the wood tone was a good one, especially for my new room. Everything else in the room is light and painted, so we really needed a piece to add some variety and warm it up a bit. OK, so on to the project. During all of my debating on what to do, a while back I saw Sarah's post about re-staining their cabinets with gel stain, and I thought that would be a good option for me. It's not necessary to totally strip the existing finish or sand down to bare wood, it just needs an initial sanding to rough it up. Sounded easy enough! 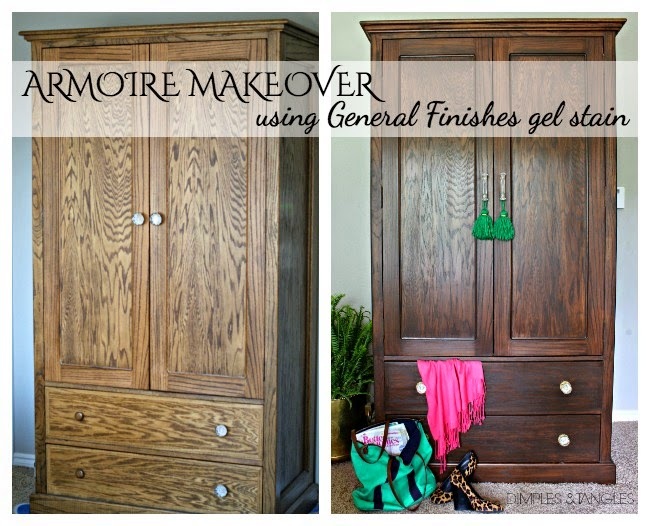 I used General Finishes gel stain in Antique Walnut. Many people love Java, but I didn't want to go quite that dark, I just wanted a warm wood tone. There is a wide variety of colors available, or you can even mix 2 together if you're looking for a shade in between what's available. I found it at our local Woodcraft, but it's also available on Amazon. You'll also need 80-150 grit sandpaper (I used 80), a foam brush, mineral spirits, gloves, and soft, clean rags (I cut up old t-shirts). 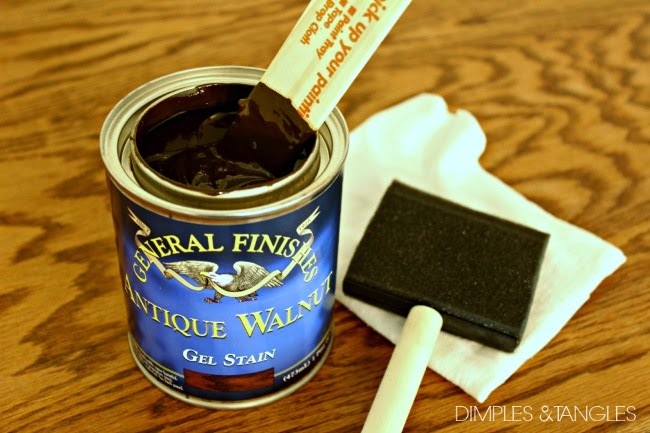 Generally, I followed the directions on the stain can, and the General Finishes website has even more helpful tips, but here is the process I used. First, I prepped my area. This thing is massive, and there was no way we were moving it outside to work on. I did remove the doors and drawers and worked on them in the garage, but left the frame in place. The sliders were still under it from when we painted the room 2 years ago (good grief), so I taped off the carpet around the rest of the bottom, then covered what was still inside the large section with some old towels. 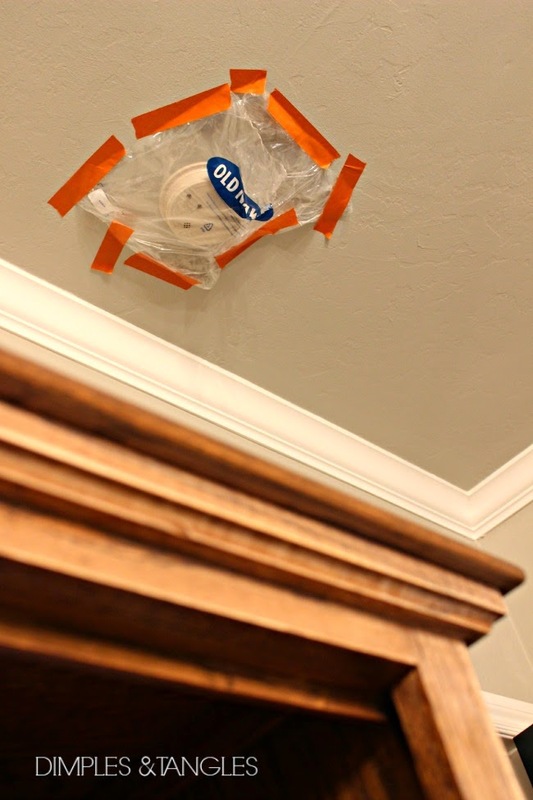 Also, if you have a smoke detector near where you're working that's wired into your house alarm, you might want to cover that up. I learned that lesson from a previous project... if there's too much dust from sanding in the air it will set off your smoke alarm! 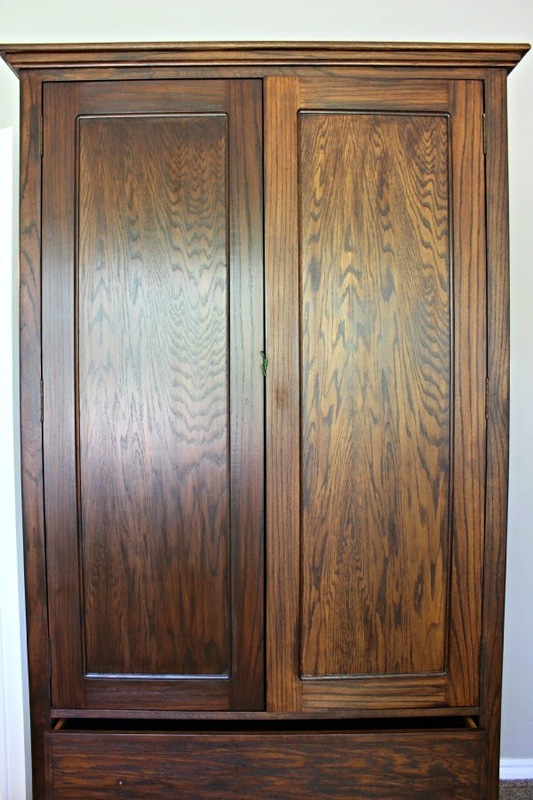 The armoire had been varnished, and the finish was still in perfect condition, so it was slick and smooth. To rough it up, I used 80 grit sandpaper on the entire piece. 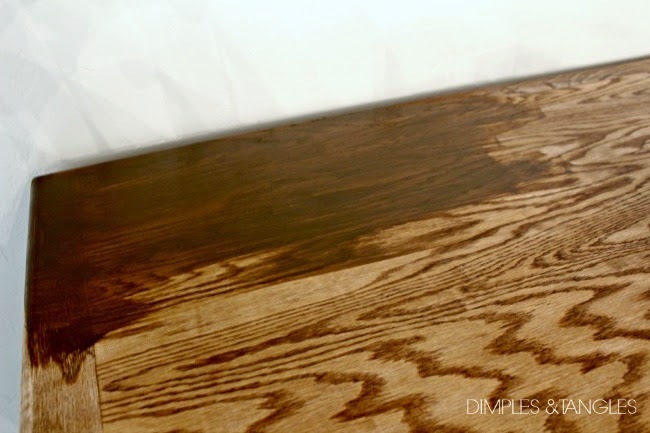 Be sure to sand with the grain, you don't want to scratch up the wood going the wrong way. I began sanding by hand, but that was taking WAY too long, so I decided to use my palm sander even though we were indoors. My sander doesn't have a fancy dust extractor, but I've found it very helpful to hold the sander in one hand that the vacuum hose in the other, and move them both together as I work. Not a perfect solution, but it really helps cut down on the dust (read Claire's funny story here). After sanding, vacuum or wipe down everything to remove all of the sanding dust. You might need to repeat this step 2 or 3 times, make sure it's totally clean. Then, you're ready to apply the stain. Gel stain is thick, like the consistency of pudding. After stirring well to mix, start applying with a foam brush (put your gloves on if you don't want brown fingers). Work in smaller sections (like one drawer front or one side at a time). 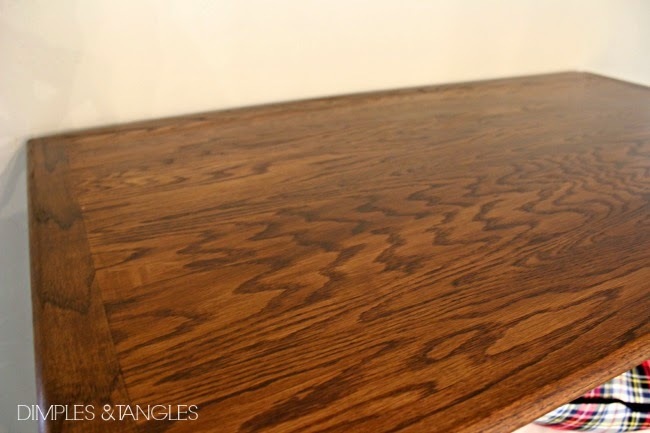 Unlike regular stain, you really don't want to let this sit for long. It becomes tacky very quickly, so as soon as you finish brushing it on, use your clean rag to start wiping it off. I found it best to wipe in long strokes, along with the grain. Keep wiping until it seems that the stain is wiped in and you have an even finish. It might not be as dark as you want yet, but that's ok. Thin coats are better than leaving it thick for a darker color, it won't dry properly. One trick I found, if you DO happen to let it sit for too long and it's hard to wipe without being sticky, dampen your cloth with some mineral spirits and then wipe it down. 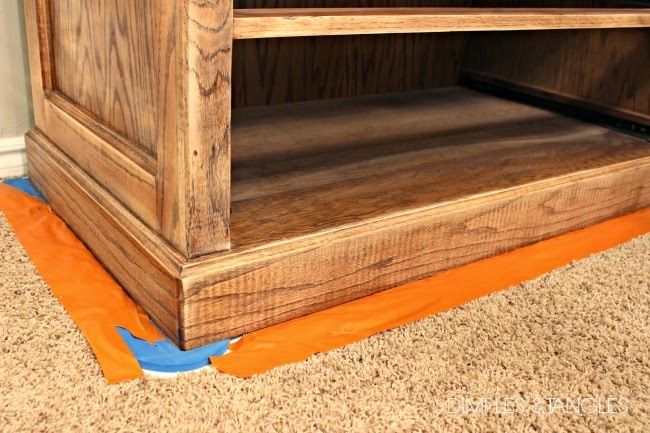 It will loosen up the stain and make it more workable again. Wipe until it's not sticky any more and you have an even finish. Let the first coat dry for 6-8 hours. Then, if you want a darker finish, use the same steps to apply another coat. Here's the difference between 2 coats and 3, so you can really see what a difference additional coats make. I did allow extra drying time between each additional coat, like 12 hours between coats 2-3, then a full 24 hours between additional coats. This project will stretch out into multiple days, mostly because of drying time, but you really don't want to rush that step. I think I ended up with 4 coats on the frame and 5 on the drawers (I had totally stripped the drawers down when I was trying to decide what to do, so since they were bare they took an extra coat). I haven't put any kind of protective coat on top and am not sure if I will. Honestly, it doesn't seem to need it. 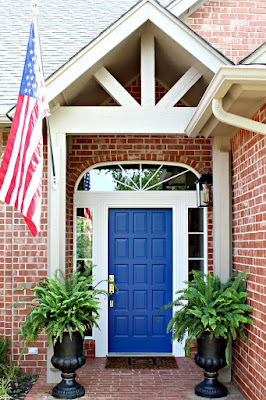 If I did this on something like kitchen cabinets, though, I definitely would use some polyurethane on top. Besides the finish, hardware was a tough choice! I didn't want it to look rustic, and nothing was seeming quite right. 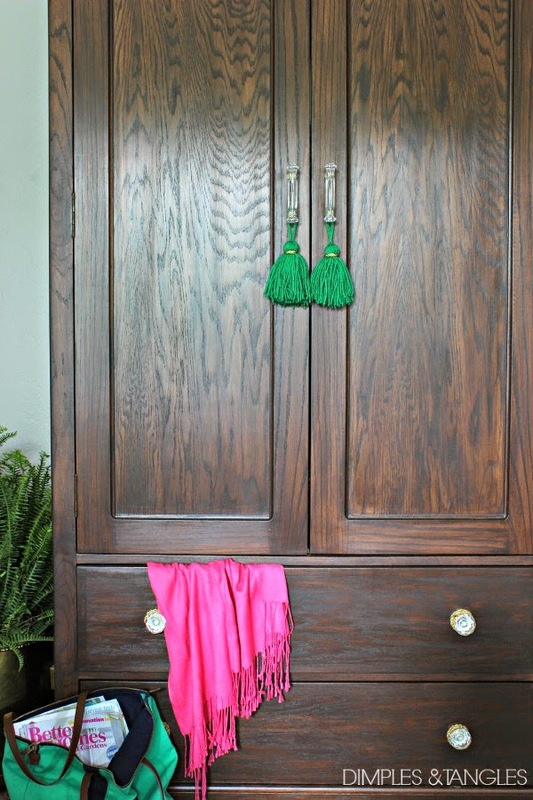 I finally settled on simple glass pulls for the doors, and clear knobs with a gold backplate to add a little more heft for the drawers. We really can't believe the difference that the darker stain made. It feels like an entirely new piece for really no more effort than painting it would have been. Have you tried gel stain yet? OK, that's your sneak peek until Thursday, see you then! And be sure to check out the Wednesday ORC gals and their big reveals tomorrow at Calling It Home, I can't wait! Wow! It looks like a totally different piece! I love the glass hardware too! I did a gel stain for the floors in my dinning room. It was awesome until I got to the second coat, I had a hard time seeing where I needed to add stain again! You did a fantastic job and I can't wait to see the entire room on Thursday! Looks gorgeous. 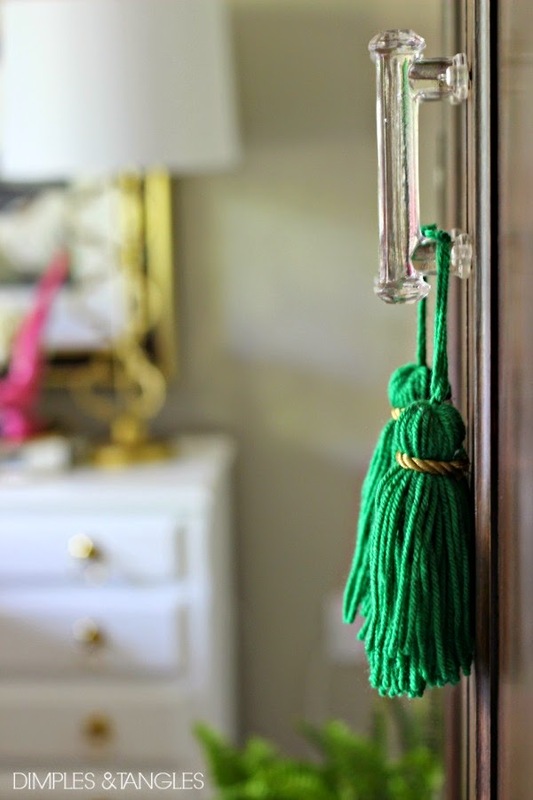 Love the green tassels! This turned out great! I love the darker stain and those glass pulls are fabulous. It's beautiful! I love the darker tone and that fabulous hardware! The perfect glitz against the wood! This totally changes it look. I love it. So pretty. I havn't tried gel stain yet, but my daughter did her hall bathroom cabinets. She loves it too. I think I need to give it a try. i love me some gel stain! and the tassels are perfection! This looks so good!! Love the stain color you chose! 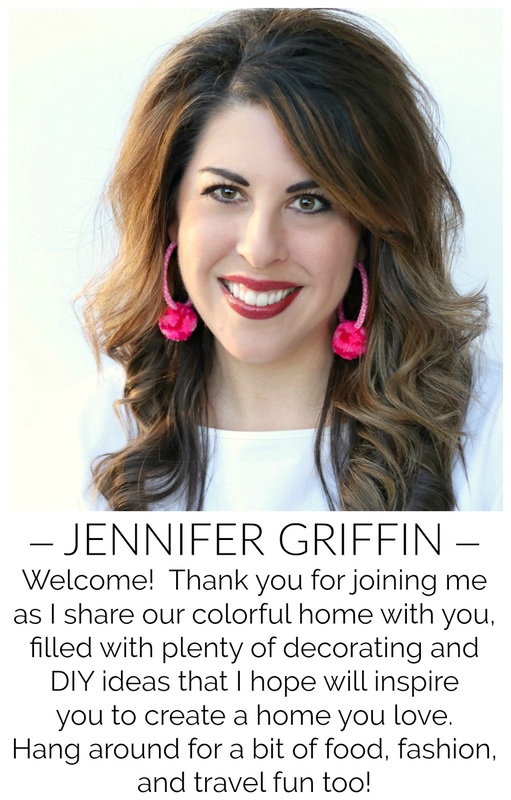 Great job, Jennifer! I definitely liket the darker finish better. Blessings! This looks so good Jennifer!!! I love the stain color. 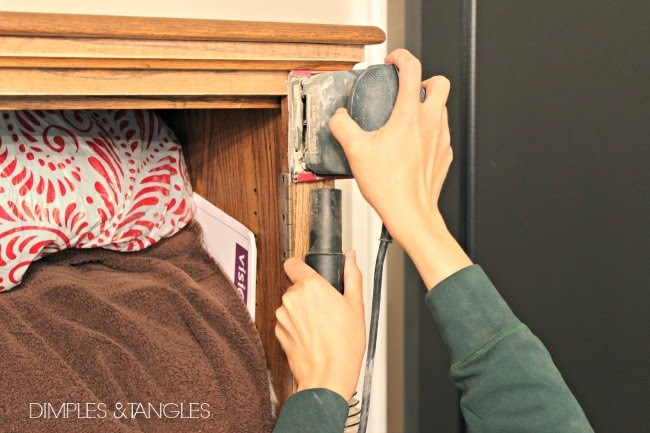 And a holding a vaccuum hose next to the sander... what a genius idea!! I'll share that with Parker for next time ;) So excited for your reveal on Thursday! Looks beautiful! I really love the color and the hardware is perfect for it. I don't know how you got everything done but I know it's going to be gorgeous! Looks great Jennifer! Can't wait for the reveal! How was the smell? More or less than regular stain? This looks so good!! I'm so glad you stuck with the wood, I think it looks so rich and adds so much depth. Can't wait to check out your room reveal! Where did you get your tassels? I love them!